I don’t get it. I called a headhunter. I threw my resume on Monster. Why isn’t my phone ringing off the hook? What the hell is wrong with the world? Why can’t everyone see just how awesome I am? My book is sweet. I swear. I’m super cool to work with. Honest. I’m witty. I’m well-read. I’m easy on the eyes. For realz. I’ll tell you why they don’t ‘get it’. 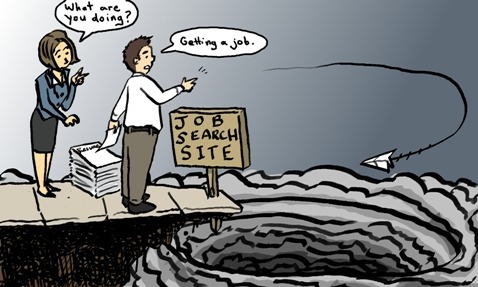 They don’t get it because you haven’t treated your job search like your actual job. If you can’t be the least bit creative with your search tactics, why in the world would anyone think you are ‘awesome’? This is your career. And yet you treat it like a chore. You should be extremely motivated and passionate about it. You get pumped when a cool assignment lands on your desk—why aren’t you equally pumped about promoting someone as awesome as yourself? I’ve never seen anyone complain their way into a job. Trust me, that is a bad strategy. If the system appears stacked against you, change the system. Work around it. Invent a new one. Stop the whining and start figuring out how to make your awesomeness more apparent to more people. I started a few networking groups on Facebook about 3 years ago. Why? Because I wasn’t happy with the job hunting process. And I saw an opportunity to use the popularity of social media to connect people in new ways. As a result, I’ve helped a bunch of people discover new opportunities and I’ve developed some great contacts along the way. There are so many ways to connect these days. Are you taking advantage? Are you friending, liking, following and Linking In with agencies and people you admire? Are you reposting, retweeting and replying to the content they share? You should be. And you should be thinking of other ways to share your story as well. Lots of people have great books. Lots of people have worked at the ‘right’ agencies. But the stench of apathy is strong. If you don’t care enough to make it happen for yourself. Why the hell should I?